Central and South America: from southern Belize and Guatemala to northern Argentina. Tropical moist forest, dry forest, savanna habitats and open grasslands; rural and densely human-populated areas. Unknown in the wild. Up to 25 years in captivity. Diet in the wild: Up to 30,000 ants or termites per day and sometimes eats fallen fruit and soft-bodied grubs. Diet in the zoo: Commercially produced high-protein pellet made specifically for insectivorous animals, fruit, mealworms, crickets, avocado, and yogurt. Weight is 40 – 100 lbs. Length is 3 – 7 feet, about half of which is tail. Height at the shoulder is 2 – 4 feet. Males are 10 to 20% larger than females. The snout is long (up to 18 inches) and the skull is streamlined with small eyes and ears. The tail is large and bushy. Fur is thick and coarse and longer towards the tail. Fur color is brown with black and white stripes on the shoulders and a crest of hair along the middle of the back. The forelegs are white with black bands at the toes. Their hind feet have 5 short claws while their forefeet have 5 claws with the inner 3 being very long (up to 4 inches long) and sharp. They walk on the wrists of their forefeet, with these large claws curled out of the way. Giant anteaters have no teeth. The tongue can be extended 24 inches outside of the mouth and has spine-like protrusions. Solitary, except for mother-young pairs or when adults come together for brief periods of courtship or agonistic encounters. When giant anteaters encounter each other in the wild they often simply ignore each other or run away, though agonistic encounters do also occur. When fights occur, individuals rear into a bipedal stance using their tail to balance and their forelimbs to fight. Diurnal, but will become nocturnal in areas of high human density or during certain kinds of weather. They are terrestrial but are good swimmers as well. They use the freestyle stroke and their long snout as a snorkel. Occasionally they climb trees and are reported to be skilled at climbing out of enclosures in captivity. Sleeping occurs in abandoned burrows, dense vegetation, or depressions in the ground. They rest up to 15 hours per day, covering their body with their bushy tail which helps to conceal them from predators. Although they have the ability to dig well, they do not construct burrows. They slowly shuffle while walking, but are capable of running quickly if necessary. Their weight is born on the knuckles and wrist to protect the claws, keeping the claws sharp so they can be used to dig ant mounds or defend themselves from predators. Most communication occurs between young and their mothers or during fighting. Communication consists of snorts, sniffs, and hisses, and roaring. Sight and hearing are diminished. Smell is highly developed — 40 times that of humans. Giant anteaters have only two natural predators — pumas and jaguars. Sometimes the anteaters try to outrun their attackers, but other times they fight. Rearing up on their hind legs, they slash at their foes with their sturdy forearms and sharp claws. 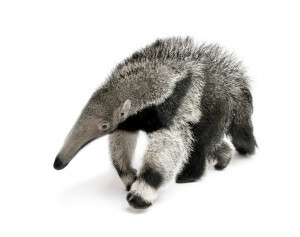 Giant anteaters have also been known to grab an attacker, crushing it with their powerful front limbs. Once per year, females give birth, standing up, to a single young called a pup. Gestation length is about 190 days. At birth, the pup weighs average of 3.5 lbs and has a full coat of hair and adult-like markings. Mothers carry their pups on their backs for 6 to 9 months. Pups suckle for 6 months. Breeding occurs year-round or seasonally depending on the region. 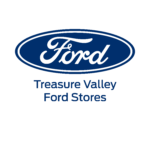 Sexual maturity is reached between 2.5 and 4 years for both males and females. Anteaters become independent after about 2 years, or when the mother becomes pregnant again, which may be sooner. Intervals between births are 9 months or longer. Home ranges vary in size, depending on the density of ant and termite mounds in the area. Home ranges can be as small as 124 acres, or as large as 6,200 acres! Giant anteaters use their immense front claws to defend themselves from predators, though their typical response to threat is to run away. Their size makes them invulnerable to all but the largest of predators, primarily jaguars and pumas. Anteaters have unique adaptations for finding and eating prey. Since their eyesight is poor, giant anteaters sniff out termites and ants. They use powerful front limbs and large claws to dig into termite and ant mounds. Anteaters have no teeth but use their long, sticky tongue to slurp up their food. Their tongue is attached to the sternum, is covered with backward-pointing spines, and can extend 24 inches outside the mouth. The tongue can move very quickly – flicking up to 150 times per minute. Salivary glands secrete sticky saliva during feeding that coats the tongue. Anteaters will stay at one ant colony for a short period of time (about 1 minute) because, if they stay too long, soldier ants arrive and begin defending their colony by biting and spraying irritating chemicals. However, in the short time giant anteaters are at a colony or mound, they can consume a few thousand insects. Giant anteaters, through their diet, have an enormous impact on local insect communities. Giant anteaters are wide spread geographically, but they have disappeared from parts of their range due to habitat loss, hunting (for food, fur, sport, and wildlife trade), collisions with cars, and predation by domestic dogs. Where they inhabit grasslands, they are susceptible to fires (particularly prescribed fire). Their specific diet, low reproductive rates, and large body size put them at higher risk for becoming endangered. It is estimated that only 5,000 giant anteaters are left in the wild, while a small number (around 90) live in zoos in the United States. A population loss of at least 30% over the past 10 years has been estimated. They are listed on several national red data lists, and are protected as a national heritage species in some provinces in Argentina. It is considered the most threatened mammal in Central America. Giant anteaters are part of the Association of Zoos & Aquariums (AZA) Species Survival Plan (SSP). 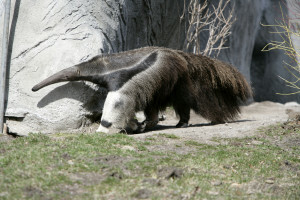 The Giant Anteater is the largest of the 4 anteater species and the only terrestrial species; the other are arboreal. Other anteaters include the Silky Anteater Cyclopes didactylus, the Southern Tamandua or Collared Anteater Tamandua tetradactyla, and the Northern Tamandua Tamandua mexicana.